Liquid gold, essence of life in the pure state. This defines the oil from Southern Aragon, the perfection resulting from using the fruit from as many olive trees as give shape to the fields that make up the Designation of Origin. The characteristics that distinguish “Aceite del Bajo Aragón” can be defined through three points: appearance (Clear with no indication of cloudiness, turbidity or sediment), colour (yellow with nuances of golden yellow to old gold, which are characteristic of the Empeltre variety) and taste (smooth, fluid oil, very pleasant on the palate with flavours that recall the fragrance of the olive tree). Moreover, extra virgin olive oil from Southern Aragon proves to be a true treasure for the health. It is the star component of the much appreciated Mediterranean diet. It is no surprise that true olive juice has been the most widely consumed monounsaturated fat consumed in the Mediterranean environment since ancient times. Highly valued for thousands of years for its extraordinary taste, a close relation has recently been discovered between intake of this oil and longer life expectancy, which means there is a decrease in the diseases caused largely by the none-too-healthy western cooking habits. In recent years, numerous medical researchers have paid particular attention to the benefits of the Mediterranean diet in general and of extra virgin olive oil in particular. In a more detailed examination, this ancestral liquid has proved to be rather more than merely a source of monoinsaturated fat. It is also a rich source of antioxidants and therefore helps to prevent the damage caused by molecules known as “free radicals” to the body tissues. Free radicals have been related with heart disease, cancer and aging. Furthermore, the beneficial effect of oleic acid helps to prevent blood from clotting in the arteries. 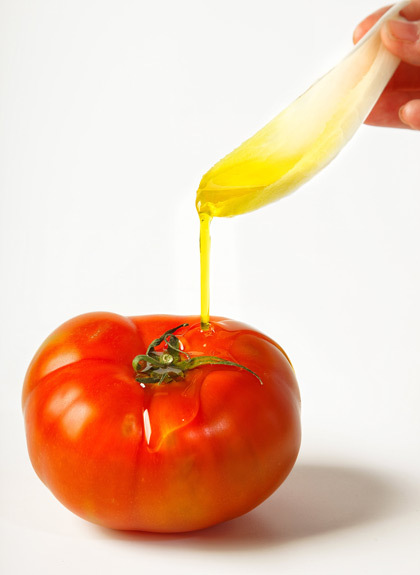 However, the benefits of olive oil go further than merely providing protection against cardiovascular diseases. Some of the so-called “polyphenols” in olive oil may have the ability to destroy substances that play a key role in the proliferation of cancer cells. Further research is of course necessary to find out exactly how this protection takes place, but evidence shows that women in Mediterranean countries suffer less from breast cancer than those in countries such as the United States or Australia, where the percentage is very high. EOlive oil also plays an important role in diabetes. Research has shown that people who enjoy olive oil in their diet have much better control over diabetes and lower levels of some fats in the blood, when compared with those who take the carbohydrate-rich diet usually recommended for this kind of diabetes. The protective effect of this oil on the metabolism, the arteries, the stomach and the bile has also been reported. It encourages growth during childhood and increases life expectancy in the elderly. It has a unique effect on blood serum lipids. Besides, olive oil appears to have a cholagogic (bile expulsion) effect and a therapeutic effect on peptic ulcers. This is the oil that provides most vitamins: e, a, and d.
It is the most healthy, wholesome and easily digested oil. Circulatory system: helps prevent arteriosclerosis and related hazards. Does not produce cholesterol and is magnificent for circulatory and cardiovascular diseases. Digestive system: produces an improvement in the working of the stomach and pancreas. Skin: has a protective and toning effect on the epidermis. Bone system: stimulates growth and encourages calcium absorption and mineralisation. Because it contains oleic acid, when taken raw it is beneficial for bone growth and the development of the brain and the nervous system. It is very important for the skin due to the fact that it provides vitamin E in the diet. Virgin olive oil contains vitamin E, so, due to the antioxidant effect of this vitamin on the cell membrane, it is particularly recommended for children and the elderly. Because it is natural, it is a nutritional product and does not cause weight increase.